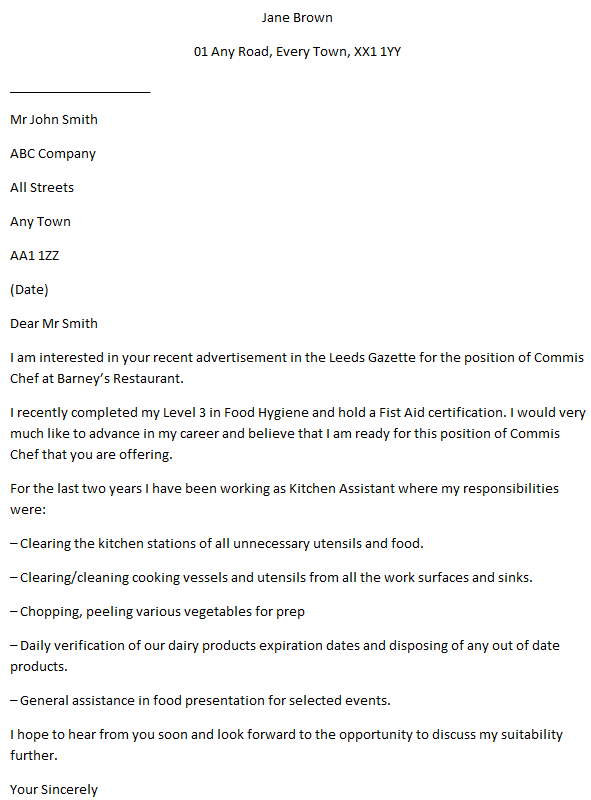 Cover letter example for a commis chef job. You can amend this letter as suitable and apply for latest job vacancies. Further to your advertisement in the Chester News I would like to apply for the position of commis chef in your country house hotel. I am an experienced commis chef, but I am currently working in a smaller establishment and I now wish to further my career. You will see from my enclosed CV the details of my training, qualifications and experience. I love using fresh local ingredients whenever possible, and I understand that your head chef specifically changes the menu to take advantage of seasonal produce. Your hotel has a very good reputation for high standards and I feel that I am ready to take up this challenging position. I understand that this is a live-in position which, owing to the rural location of your hotel will be ideal for me. I enjoy creating new dishes in my free time and am delighted when they are perfected so they can be added to the menu. I do hope that you will consider my application. I would be pleased to attend an interview at a date convenient for you and I hope to hear from you in due course. I am interested in your recent advertisement in the Leeds Gazette for the position of Commis Chef at Barney’s Restaurant. I recently completed my Level 3 in Food Hygiene and hold a Fist Aid certification. I would very much like to advance in my career and believe that I am ready for this position of Commis Chef that you are offering. The job requirements appear to be more challenging and varied than those I have grown used to at my current job at Nando’s. I would like to expand my knowledge, learn new responsibilities and be able to further my career within the field. – Clearing the kitchen stations of all unnecessary utensils and food. – Clearing/cleaning cooking vessels and utensils from all the work surfaces and sinks. – Daily verification of our dairy products expiration dates and disposing of any out of date products. – General assistance in food presentation for selected events. I believe that I would excel at menu suggestions and planning, cooking meals, guiding the serving staff as to what the daily/weekly specials were all while being able to continue to learn from the chefs during their daily tasks. I hope to hear from you soon and look forward to the opportunity to discuss my suitability further.